Seasonal foods have come into their own in recent years. From pumpkin pie pancakes and Halloween Oreos to peppermint mocha lattes, gingerbread ice cream and hot cocoa-flavored Cocoa Puffs, it seems we cannot get enough of these limited-edition items. But some seasonal items leave us scratching our heads. Case in point: Pringles "Thanksgiving Dinner in a Can." This is not the first year the snack company has released the holiday-flavored item. The Thanksgiving chips actually debuted (in very small quantities) in 2017 and came in eight flavors — turkey, mashed potatoes, stuffing, cranberry sauce, creamed corn, green bean casserole, mac and cheese and pumpkin pie — but according to Kellogg's, only three flavors will be available this year: turkey, stuffing and pumpkin pie. 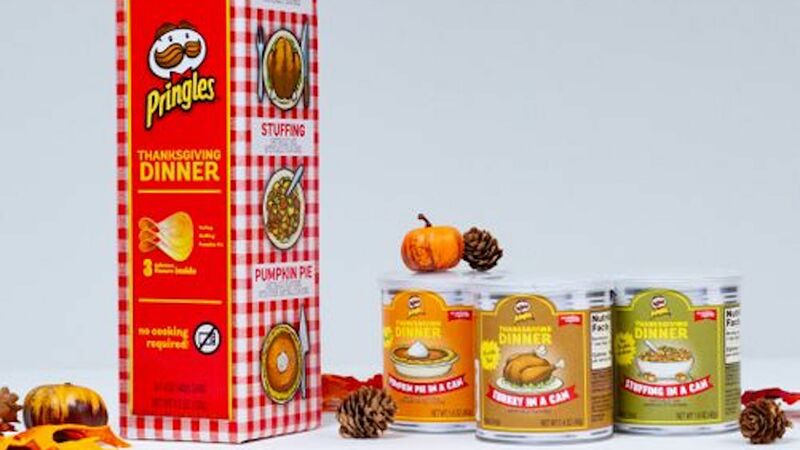 Yuvraj Arora, senior vice president of marketing for Kellogg’s U.S. Snacks division, said in a press release that the return of the chips was inevitable: “When we launched Pringles Thanksgiving Dinner last year, it was so exciting to see Pringles fans’ positive reactions. We knew that we had to get Pringles Thanksgiving flavors in more people’s hands this year —particularly hearing that Turkey, Stuffing and Pumpkin Pie not only were delicious but truly tasted like the real deal.” Yet in spite of the "positive reactions," we are still not sold on this seemingly strange snack — and we are not alone. Reactions on Twitter were mixed at best. @Pringles I missed out last year so I definitely want in this year on the Thanksgiving dinner chip set!!!! Please please please!!!!! I should note that none of our editors or writers has tried these chips — and they may be good! But something about the thought of Thanksgiving dinner coming "in a can" is just off-putting, at least to this writer. However, if you are hoping to try these chips, get ready. All three flavors will go on sale on the Kellogg's website at 11:59 p.m. on Tuesday, Nov. 6.